Exploration of a cave can present enormously varied challenges. An outing could include a gentle amble down a wide flat passage, a wet and muddy crawl up to the eyebrows in water, an easy scramble up a slope and hanging precariously from the end of a rope over a yawning chasm. Technique is the key element that will allow you to negotiate all these obstacles, enjoy the wonders of the underground wilderness and return safely to the surface. Even if a passage is wide and high enough to allow you to walk at a good pace, always concentrate on where you put your feet. Safety must be your prime concern, so look where you are going. 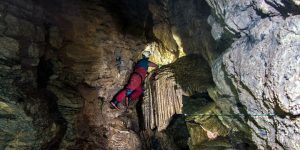 Cavers often encounter obstacles where they least expect them they may overlook a rock in the path, stumble and fall, or the cave floor may suddenly vanish into a deep pit. 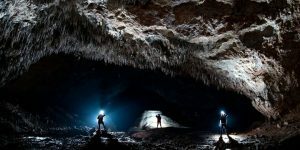 Injuries sustained far from the entrance of a cave could turn an outing into a serious nightmare for the entire team. In very low cave passages you will have to stoop. If you are forced to proceed like this over lengthy distances you could experience backache, especially when you are carrying a heavy bag. Avoid pain by straightening your back every now and again, even if it means squatting or sitting down. When the passage gets too low you will have to crawl. This is where gear such as thick leather gloves, knee pads and a peakless helmet are useful. The helmet will let you see the passage ahead without having to tilt your head too far back and padding will protect you from the floor. Try not to drag your legs on the ground, but lift them clear off the cave floor as you move forward. Dragging your feet will wear away the toes of your boots and create friction that will tire you quickly. In exceptionally low passages your only option is to lie flat on your stomach and pull yourself along. Once again, avoid dragging yourself along as this creates unnecessary friction. Instead, lift your body as much as you can before manoeuvring arms and legs forward. You may also have to remove your helmet and turn your head sideways to fit through. If you are forced to do this, push your helmet ahead of you, turning the light away from your face. Beware of pushing the helmet so far forward that you cannot reach it anymore. When you are crawling along a passage, you can avoid any protrusion or puddle you encounter by hovering over it in a press-up position. You need very good upper body strength to do this as your body weight will have to be supported on your hands and toes while moving forward. Obviously, this technique is only effective if the passage is high and wide enough. Once you have mastered it, however, you will be able to avoid a variety of smaller obstacles. When you are pulling yourself forward in a low, narrow passage, try not to get your elbows trapped too far behind your shoulders. There is a chance that you will pull yourself forward and end up lying on your arms. The narrow passage will prevent you from moving your elbows out to free your arms, while the low ceiling will prevent you from lifting yourself up. Avoid this situation by keeping at least one arm extended in front of you at all times. Your progress will seem slower, but the chances of getting stuck are greatly reduced. Water in caves can be extremely dangerous and must always be treated with caution, especially when it is flowing swiftly, because the power of the current could easily sweep you off your feet. If you have to cross an underground river or move along a stream passage that is filled with deep, flowing water, it is wise to attach a rope to your body and have someone else belay you to safety from the bank. 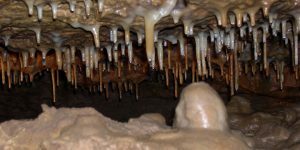 Sump is the caving term used to describe the point at which the water in a passage meets a very low cave ceiling, thus filling the passage completely and flooding it. Some sumps are only a few centimetres long, but you may encounter underwater stretches of a considerable distance. Submerged stretches measuring less than 1m (3ft) are sometimes known as ‘ducks’ (note, however, that in the UK this term describes a water-filled passage with an airspace). It is impossible to estimate the length of unfamiliar sumps without entering and surveying their underwater course a task best left to experienced cavers. This makes them potentially very dangerous. Avoid them unless you know exactly how long they are and that they may be negotiated in safety. Never hold your breath, but exhale while you are moving through a sump. Also remember that the fine silt in cave rivers is easily stirred up, this will blur your vision if you are diving with your eyes open and can also cause serious disorientation. 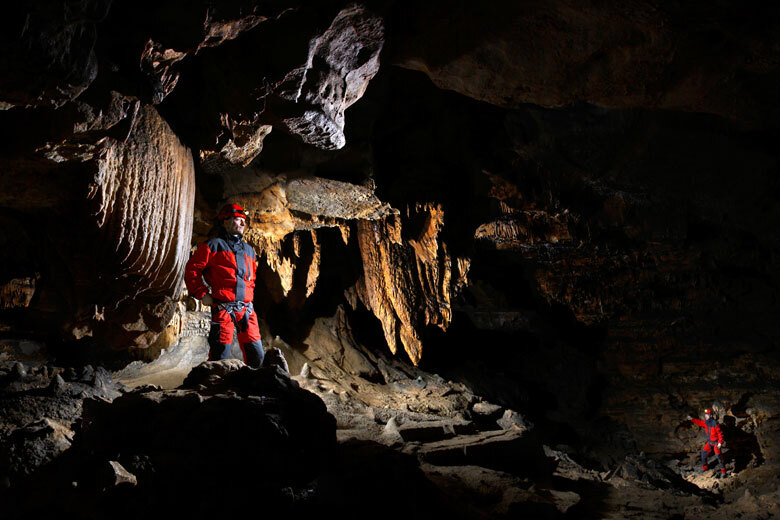 Not all caving is horizontal; some of the most exciting manoeuvres involve dangling at the end of a rope. 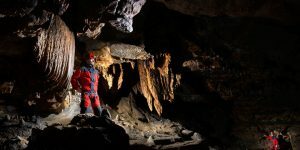 The use of ropes in caving is known as Single Rope Technique (SRT). For obvious reasons, expeditions that require you to negotiate large vertical drops are more dangerous than horizontal caving. 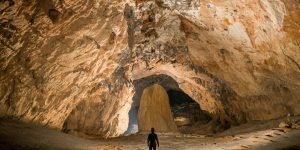 Before you venture into any cave, it is wise to join an organized club in your area so that you can learn from experienced cavers. A little rock climbing experience will not prepare you adequately for the rigours of caving. 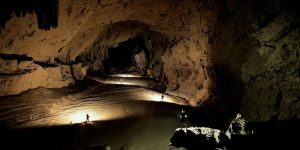 While there are similarities between the two, the dark, confined environment of caves makes movement much more difficult. For this reason, you must learn correct rope technique and focus on the importance of safety whenever you go caving. Belaying can mean different things: it refers to the practice of attaching a rope firmly to a rock or a cave wall to act as an anchor, but is also used to describe a rope that runs between two cavers to protect them from falling down while climbing up. The belayer, too, should be firmly attached to a solid anchor so that neither caver is pulled off the edge of the pitch. The belayer gives the climber enough slack to enable him to move with ease while keeping the rope as taut as possible. Should a climber accidentally fall, the friction device would lock to prevent or slow the fall. In the event of a fall, ensure that you have enough rope, so that you can be lowered to safety or a position from where you can rescue yourself and your partner.